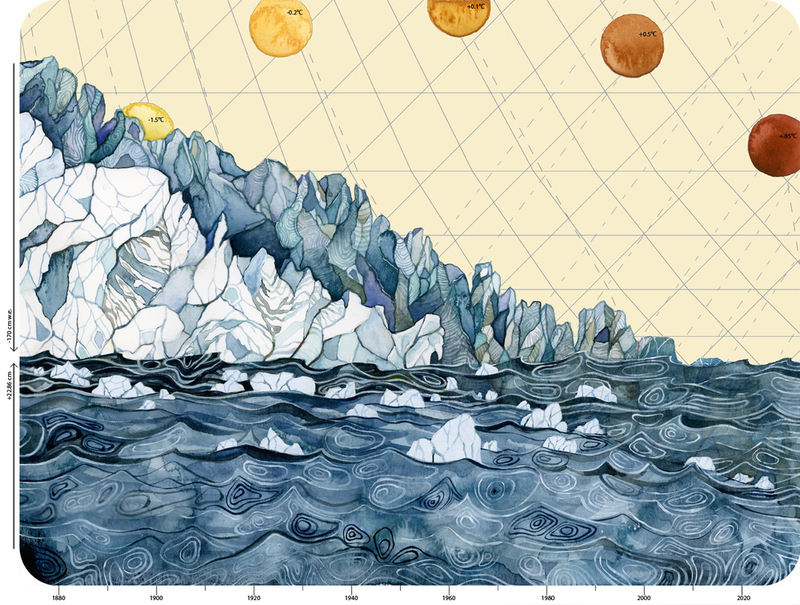 Image: “Climate Change Data” by Jill Pelto. Some readers may remember that I was crocheting a blanket based on global surface temperature data from the last 166 years. If you don’t remember, I was crocheting a blanket with each row representing one year of surface temperature anomaly from 1850-2016. More details on the design process are here. Well, I finished it! But you’ll have to wait until the end to see the pictures of the finished blanket. This project took a truly epic amount of yarn (20+ skeins) and time (50-60 hours is a conservative estimate). There was also a time limit to this, since there was no way I was going to lug this huge blanket back down with me to Berkeley, since I was already checking a bag to bring down my backpacking gear. So I had to finish the whole thing within the 3 weeks that I was at home in Seattle. The first step was to acquire yarn! I used Bernat Satin because it’s the cheapest, but it’s also extremely soft, unlike other cheap yarns that are rough and gross. This is totally what Bill Gates invented Excel to do. Then, it was time to get crocheting! My goal was to complete about 8 rows per day, which would put me on track to complete the blanket in time. Since it took me at least 15-20 minutes to complete a row (with no color changes), that basically meant that I crocheted for 2-3+ hours per day, mostly in the hours between 12-2am (sorry mom). A few days later, I finished up crocheting the base period, which was from 1850-1900. The average temperature over this period is defined as “zero” temperature change, and all other surface temperature anomaly is defined according to this baseline. The base period. The one dark yellow row in the middle was from a particularly strong El Niño in 1878. Anyway, enough babbling about myself: here are the finished photos of the blanket! Kelly for scale. This blanket was literally 8 feet long. Shoutout to Carol for her dedication to taking good photos at 3am when we had a flight back to California the next morning – she literally stood on a chair and held the phone up to the height of the ceiling to be able to capture the whole blanket in one picture. The most concerning part of this project was the rate at which global warming is accelerating – this year is by far the hottest year ever, and before that, there were 14 years straight of red, compared to the much more slowly increasing light yellow/yellow in the middle of the blanket. The year I was born was the first year that the temperature was red, and it’s only gotten hotter since then, and it will only continue to get hotter. As for the blanket though, it’s now folded up and sitting on my chair at home because nobody in my family has a use for it, and that is all. I love this blanket! So creative! How do you come up with these ideas?